I can hardly believe I am in our fantasy football league’s championship game. I know. It is mostly luck. But I am still excited that I made it. Especially, since I had such an inauspicious start (2-5) and was seeded next to last in the playoffs (seventh) with the second lowest points scored among those who made the playoffs. And since I dodged a bullet by a week (my semi-final opponent scored over 170 points in the quarterfinal game), I feel fortunate indeed to be playing in the ultimate game of the season. Being in the championship game is the epitome of fantasy football. (Actually, the epitome is winning and getting our trophy called “Epitome,” but I do not want to jinx myself by saying so.) Some would say that it means I have done a great job of drafting players (but I have a roster that only has 3 of 15 of the players I drafted). Others would say that I have a knack of looking at statistics and picking up the right players at the right time (but I have had more players do well after I dropped them, than I can count). Still others might think that I just play players with favorable matchups (but even though I read what the pundits have to say, I really do not know which players match up best against which teams). In reality, I am just lucky. Actually, I am not just lucky. My quarterback and my best running back were part of my draft. I have had plenty of waiver wire pickups who scored well after I picked them up. I have also done well choosing which players to play which week (even though one of my starting receivers scored zero points last week). In short, my success has not just been luck. It only seems that way. If I was to give any advice to fantasy football managers or coaches or whatever people call them, I would say a few simple things. First, play your “Go to” guys. They are the ones who consistently score points, so you need to have them in your lineup. Everybody knows that, but it needs to be said. Then, look to the player with the hot hand. While you cannot predict a coin toss based on the previous one, you can see when players are having a streak. Play the streak. Then of course, you need to take into account who is playing whom. 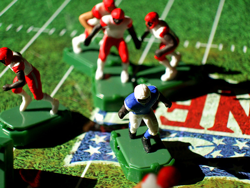 Some players do better against certain opponents than do against others, which is why the fantasy football experts emphasize which teams give up points to which positions. It makes statistical sense. Lastly, you need to go with your gut. There are times when you need to ignore the statistics, go against the predictions and just trust your instincts. After all, your gut feeling can be your subconscious recognizing patterns. Or it might just be the food you ate before you set your lineup. Despite my own practices in choosing players and setting my own lineups, all I know for sure is that this final game of the season could come down to a trade that I did not make. My worthy opponent (who won the regular season and scored the most points) had offered me a good receiver for a good running back. My reason for not trading him was because I did not want that running back to beat me in the playoffs. If I qualified. He had precious few running back options then and if those options kept scoring few points, I might be able to beat him. If we met in the playoffs. I did not trade him as a defensive move. Just in case. It turns out that I could have used that receiver down the stretch, and I ended up dropping my running back due to a season ending injury. Looking back, I could have gotten something for nothing, instead of nothing for nothing. I do not begrudge my running back. After all, he got me many points throughout the season. I just wish I could have seen that the trade was a good one for both of us at the time and would not have hurt me in the playoffs after all. In fact, the receiver he was willing to trade me could hurt me in the championship. Oh well. C’est la vie. I am excited to be in the ultimate game of the fantasy football season this year. I just hope that my drafts, my pickups, my matchups, and my luck hold out. I hope that my lineup stands the scrutiny of hindsight and second-guessing. And I hope that my no trade does not come back to haunt me. Regardless of the outcome, when all is said and done and the 2014 fantasy football season comes to an end, I will either be a champion hoisting our trophy, “Epitome,” or an also ran. Believe it or not, I will be happy either way. Probably because I can still hardly believe I am in the championship game.